A Joint Interagency Task Force (JIATF) may be formed when the mission requires close integration of two or more USG agencies. Formation of a JIATF requires significant coordination among the participating agencies. The joint interagency task force (JIATF) is a force multiplier that uses a unique organizational structure to focus on a single mission. A JIATF is typically formed for a specific task and purpose as are most task forces. JIATFs are formal organizations usually chartered by the DOD and one or more civilian agencies and guided by a MOA or other founding legal documents that define the roles, responsibilities, and relationships of the JIATF’s members. The JIATF is staffed and led by personnel from multiple agencies under a single commander or director. Forming a national level JIATF takes a national charter that lays out authorities and mandates membership and resourcing. An executive order, national level directive, or mandate from the NSC/HSC that directs all agencies involved to support the JIATF with actual resources may be required. SecDef may, in cooperation with other Cabinet members, form a JIATF through the establishment of detailed memoranda of agreement. JFCs can form JIATFs with one or more USG agencies based on mutual cooperation and agreement. The establishment of functional and enduring JIATFs transcends the internal capabilities and authorities of combatant commands and JTFs. 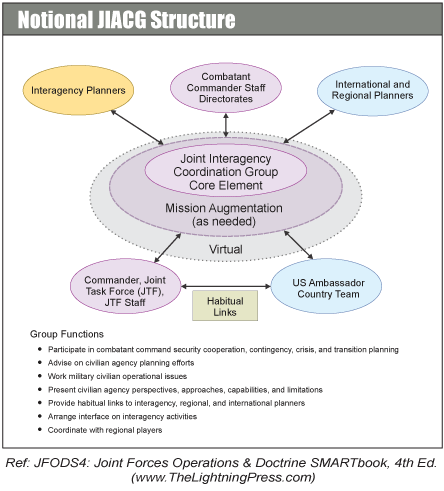 Based upon the analysis and the desire to establish JIATFs, the Joint Interagency Coordination Group (JIACG) (or equivalent organization) or another designated staff entity should document the requirements for formal submission through command channels to JS and OSD for approval and pursuit through the NSC or HSC system. Success would be manifest in interagency consensus, commitment, and MOAs or MOUs that infuse JIATFs with supporting policy, legitimacy, defined purpose, authorities, leadership parameters, functional protocols, and resources. A Joint Interagency Coordination Group (JIACG) is an interagency staff group that establishes regular, timely, and collaborative working relationships between civilian and military operational planners. Coordinating authorities, channels, and terms of reference must be carefully established and documented for JIATFs, with the aim of facilitating their missions and flexibility while not promoting duplication of effort and confusion. Such authorities constitute the rules of the road for JIATFs, and they must contribute to unity of effort and common situational awareness. Increasingly, JIATFs are being formed to achieve unity of effort and bring all instruments of national power to bear on asymmetric threats. JIATFs are often created to address problems such as militias, “bad neighbors,” and foreign fighters, all of which complicate the security environment. JIATFs may be separate elements under the JFC, or they may be subordinate to a functional component command, a joint special operations task force, or a staff section such as the J-3. JIATF members can coordinate with the country team, their home agencies, JIACGs (or equivalent organization) in the area of interest, and other JIATFs in order to defeat complex hostile networks. Because they use more than the military instrument of national power, JIATFs are generally not a lethal asset, but rather develop and drive creative nonlethal solutions and policy actions to accomplish their mission. When it is necessary to engage the military instrument of national power, and to establish a JTF, the establishing authority is normally a CCDR. The CCDR develops the mission statement and CONOPS based upon direction from SecDef as communicated through the CJCS. If developed, the NSC’s interagency plan may affect the mission statement. The CCDR appoints a commander, joint task force (CJTF), and, in conjunction with the CJTF, determines the necessary military capabilities required to accomplish military objectives. A CJTF has the authority to organize forces and the JTF HQ as necessary to accomplish the objectives. Unlike the military, most USG agencies are not equipped and organized to create separate staffs at the strategic, operational, and tactical levels, with the result that JTF personnel interface with individuals who are coordinating their organization’s activities at more than one level. The USG interagency process requires the JTF HQ to be especially flexible, responsive, and cognizant of the capabilities of USG agencies, IGOs, the HN, and NGOs. The JTF HQ provides an important basis for a unified effort, centralized planning and direction, and decentralized execution. Depending on the type of operation, the extent of military operations, and degree of interagency, IGO, and NGO involvement, the focal point for operational-and tactical-level coordination with civilian agencies may occur at the JTF HQ, the joint field office (JFO), the CMOC, or the humanitarian operations center (HOC). JTF personnel may also participate actively or as observers in a civilian-led functional coordinating group, concentrating on a specific issue or project. • Upon activation of a JTF overseas, its role must be clarified with the CCDR regarding direct liaison authority with the affected COM(s) and with the senior defense official (SDO) in terms of speaking with one voice to the COM and the country team. • Sending LNOs to an embassy is a negotiated process; it is not automatic. There are a number of reasons that a COM may not want additional military in and around the embassy. • Avoid overwhelming interagency partners with JTF coordination and planning demands by channeling most communications through the LNO team. • Designate the staff office responsible for interagency coordination. Many JTFs designate their plans directorate of a joint staff (J-5) or CMOC with this responsibility. Provide appropriate resources for this function. • Where both a large country team or JFO and a military JTF exist side-by-side, detailed procedures should be developed for staff coordination. • For CS operations, the JTF HQ is ideally colocated with the JFO per NRF guidance. All ESFs are represented in the JFO. • Consider also how to integrate military elements that may not be part of core JTF (e.g., special operations forces, to include those conducting train and advise missions). This article is an extract from “JFODS5: The Joint Forces Operations & Doctrine SMARTbook, 5th Ed. (Guide to Joint, Multinational & Interorganizational Operations)” by The Lightning Press. Download a free PDF sample and learn more at: JFODS5: The Joint Forces Operations & Doctrine SMARTbook, 5th Ed. (Guide to Joint, Multinational & Interorganizational Operations). Additionally, for 400 pages of detailed discussion of joint strategic and operational planning refer to Joint/Interagency SMARTbook 1: Joint Strategic and Operational Planning (Planning for Planners).